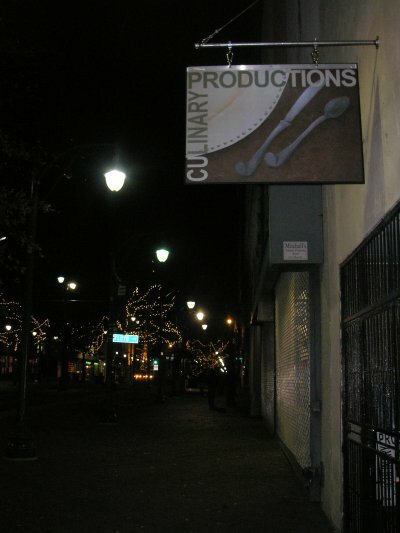 Congratulations to my friends at Culinary Productions, who have their new restaurant open at 22 S. Main, on the Main Street Mall between Madison and Monroe, in the location that used to be Memphis Grits. Long-time readers of my blog will recall my writing last summer about a chef who moved into my building and started a catering company. He had worked in four-star restaurants across the US, and my neighbors and I enjoyed many fine meals that he cooked on our apartment building’s rooftop. Well, now you can enjoy his cooking too! They’re open for lunch and dinner at their Main Street Mall location. Menu changes daily. It’s four-star food but it’s also very informal, and reasonably priced for what you get. So if you work downtown, I highly recommend you stop by for lunch and treat yourself to some great food. – My blog generated a record 88 visits on Thursday, although 3 of those were mine, checking to see if my pages published. Wonder if I’ll have my first 100+ day in January. – I didn’t make it to the Dempseys show at the Saucer as planned. I came down with a cold, and I knew that I needed to knock myself out with some NyQuil and get a good, solid 10 hours’ rest, not go out and drink beer until 1:30 in the morning. In my experience there’s nothing better to beat a cold than good, sound sleep. The Dempseys will be playing Huey’s downtown location Sunday, January 8, so I’ll see them then. – I did make it out to the Trolley Art Tour for a couple of hours last night. You know how I’ve written a couple of times about “that gallery on G.E. Patterson, in the Arcade building” that I like so much, but never could remember the name? Well, last night I made it a point to get the name. It’s Universal Art Gallery, owned by artist Arnold Thompson. He features a different artist every month, but if you go in make sure you ask Arnold to see HIS work, which I think is really outstanding. – Also found out that my friends at Etched Art are closing their Main Street storefront, but their custom laser etching business will live on. – After Trolley Tour I ended up having a couple of drinks at the bar at Stella. Very inviting place and I felt right at home there, friendly people. I really appreciate that one of the finest places to eat in the city has such a down-to-earth atmosphere. – I was annoyed to discover that I couldn’t get in the Tap Room last night. Tulsa fans, in town for the Liberty Bowl, had rented out the entire half-block consisting of King’s Palace, the Tap Room, Blues Hall, and Rum Boogie Cafe. I’d love to know what they paid for that. Somewhere in the five figures, I’m guessing. AND all of them were jam-packed with Tulsa folks buying food and drink, probably as busy as they are for Music Fest in May. Bet that made it a happy new year for Preston Lamm, who owns all those businesses. – But since it was Tulsa’s fault I couldn’t visit my mug at the Tap Room, I’m rooting for Fresno State in the Liberty Bowl. – Still no plans for tonight, which is exactly the way I want it. New Year’s Eve is amateur night for partying, and those people can have the town. 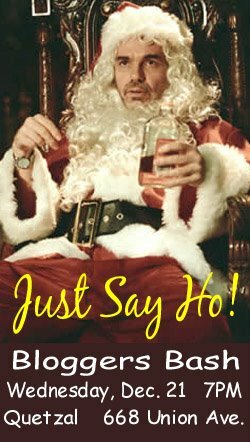 Unless inspiration hits me tonight, this will be the last blog entry of 2005. So have fun, be safe, and I’ll see you next year! – COMING SOON: Read my blog, get free stuff. Check back in a few days to find out how.